The Venerable Geshela Thupten Phelgye -- pictured in the center he founded -- came to Spokane six years ago to teach Buddhism. Doug Nadvornick profiles Thupten Phelgye (pronounced TOOP-tun PELL-gay), the founder of the Buddhist Institute of Universal Compassion in northeast Spokane. ’Tis the season and people celebrate it in different ways. Christmas is, of course, December 25, the day Christians celebrate Christ’s birth. Hanukkah is the Jewish holiday celebrating the Maccabees’ victory over the Greek army about 22-hundred years ago. This year, Hanukkah begins at sunset December 12 and runs for eight days. On Friday, some Buddhists around the world celebrated Bodhi Day. It’s the day on which Buddhists celebrate the man now known as the Buddha as he gained enlightenment while sitting under a Bodhi tree, 2600 years ago. Some celebrate it in December. But because, historically, different cultures have lived by different calendars, others, such as Thupten Phelgye, celebrate it in on a day with a full moon in May. “That was the day celebrated as Buddha’s birth, a day of getting enlightened and the day of passing away. All of those three events occurred in the same month. It’s kind of a triple auspicious day we celebrate,” Phelgye said. Thupten Phelgye is a monk and the founder of the Buddhist Institute of Universal Compassion in northeast Spokane. He was born in Tibet in 1956. He was a young child when his family fled their country when the Chinese invaded. They made their way through the Himalayan Mountains and settled, as the Dalai Lama did, in India. Later, Phelgye worked with Buddhism’s spiritual leader. 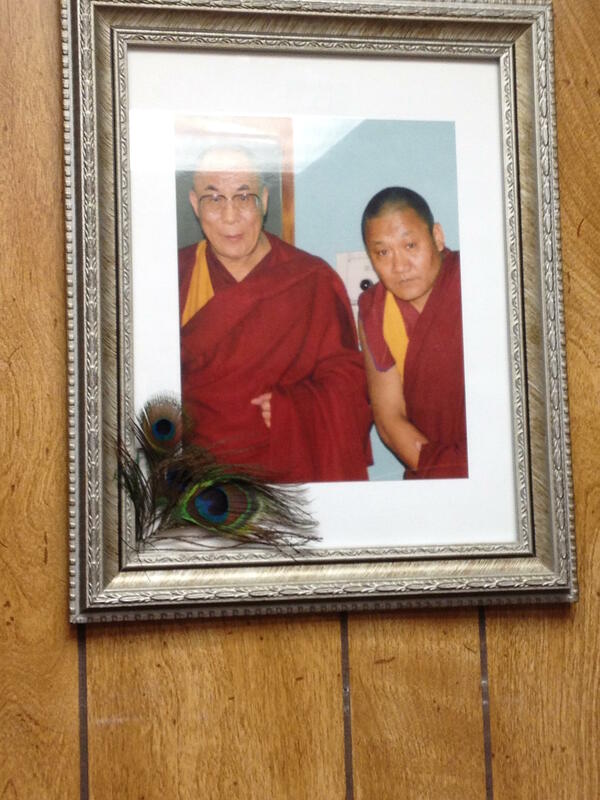 This photo of a young Thupten Phelgye with the Dalai Lama sits on the wall above the desk in Phelgye's office. “Yeah, I’ve been very fortunate. I had a very close association with His Holiness, not only as a teacher, but also I had the pleasure to serve in our government for many years,” he said. That’s the Tibetan Parliament in Exile, based in India. In 2011, Phelgye wanted a change so he left politics and headed for the United States. He spent some time in California and, on a trip north to Canada, made a stop in Coeur d’Alene for a speaking engagement. There he was asked to come to Spokane and speak at Gonzaga. He did a year later. That little group now attends teachings at his Buddhist institute, which is based in an old house renovated last summer not far from Rogers High School. Phelgye’s religious title is Venerable Geshela, which is roughly equivalent to calling a Catholic priest “Father”. He’s also a Global Scholar in Residence at Eastern Washington University in Cheney, where he lives. “Buddhism is based on learning and rational common sense, rather than a faith system. It doesn’t mean Buddhism does not have faith and devotional rituals. We do. But that is not what Buddhism is based on. Buddhism is based on realistic, practical karma; cause and conditions," he said. "It is to follow your thoughts and actions and understanding that your experience, good or bad, is based on your thoughts and intentions and actions. There’s no external power that will dictate anything on you. It’s you. You are your own refuge, you are your own enemy,” Phelgye said. When Phelgye chants and speaks with his followers, he dresses in his maroon and saffron robes. He sits on a cushion, legs crossed. 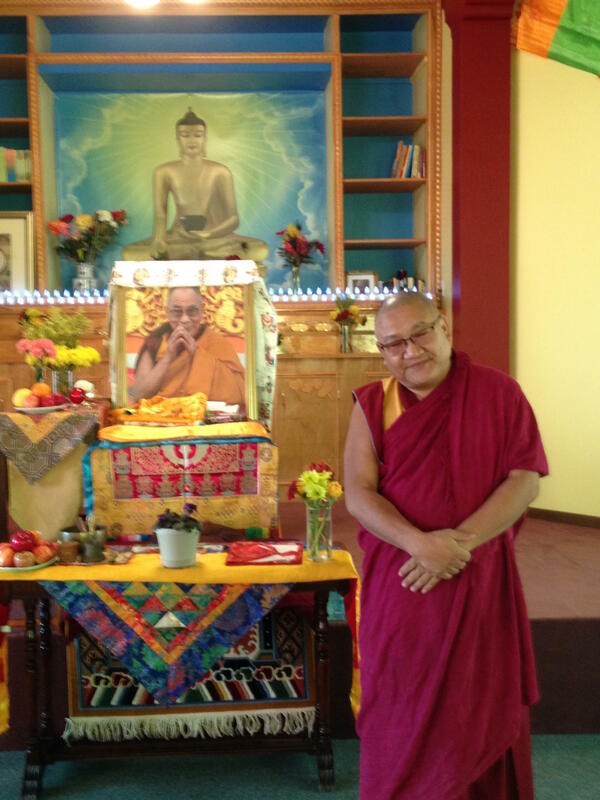 Behind him on a chair sits a portrait of the Dalai Lama. In front of him is a laptop where he keeps his speaking notes. About 15 people are facing him. Some are also sitting on pillows with legs crossed. A few sit on chairs. There’s a mix of ages. Some are middle aged or older, as well as a younger man with his daughter. To the monk’s left are the colorful Tibetan prayer flags you sometimes see in pictures of mountaineering camps in the Himalayas. The heaters at the side of the room are working overtime to take off the chill. Later in his basement office, we resumed our conversation. Doug: “So we think of monks as these beings who deny themselves material things. I look at you at your desk. You’ve got your laptop there. You’ve got your iPhone there. How has being American over the last six years affected who you are as a person?” Doug Nadvornick asked. “We’re living in the 21st century, right? The science and technology has changed the world. Without this technology there is almost no way to function, right? If you are in service of humanity, if you try to make a difference, you definitely are dependent on these technologies. We had been using all of these gadgets back in India too," Phelgye said. “I’m reminded of the bumper sticker that says ‘What would Jesus do?’ What would Buddha think of the life you live now?” Nadvornick asked. “We live in the 21st century, whole world running after materialism. And that’s where Buddha talked about attachment," Phelgye said. "He talked about four noble truths and, within that four noble truth, the attachment is the key point, how attachment causes all of the problems. But that is why the attachment becomes very powerful and that’s where everyone runs after, materialism.